After getting my green sleeve back, I was able to get back to shooting the competitions. Yesterday I went back and caught the figure skating pairs competition and today I caught a couple performances by the women (before heading to the speed skating oval to capture images for another client). Most photographers are shooting figure skating with the bigger lenses like the Canon 300mm f/2.8 or Canon 400mm f/2.8 lenses, but I have been steadily relying on my trusty Canon 100-400mm lens. The lens is really sharp and easy to handhold. And I really prefer to shoot sports with a zoom lens as opposed to a fixed focal length lens, as it gives me the ability to quickly get in close, go out wide and recompose on the fly. So everything you see in this post was taken with the Canon 1D X MK II and the Canon 100-400mm lens. As always, I am usually firing the shutter when the skaters are in front of the Olympic rings or by an Olympic logo of some sort. When shooting sports, I am usually looking for the athletes eyes. So...as this woman is going around her partner, I wait for her face to come into frame and then fire off at 14 frames per second. And at this point everything was taken at 1/1000th sec. And then I switched the camera to shutter priority and set the speed to 1/30th sec and panned with the skaters. The trick to getting a shot like this (one of my favorites) is to pan the lens at the EXACT same speed as the skaters and hop that they keep their heads still for that short amount of time. The end result is so cool, with the skaters sharp and the backgrounds diffused and blurry. Shooting at a slow shutter speed really shows the motion of the skaters. When the Americans performed, I switched back to 1/1000th sec to get my "safe shots". The American skater, Mirai Nagasu, was up first so I stayed in my safe mode to capture her in action. And then once Mirai was done, I switched back to shutter priority at 1/30 sec to have more fun. This last shot is one of my favorites because there is a ton of motion in her body, but her face is perfectly sharp. So yes, there is planning and there is a little bit of luck involved as well! Jeff I'm really enjoying following your photographic journey at the Olympics. Thanks for the posts! I am learning a ton about your thought process here. I will be in the stands Thursday to see team Canada play the Swiss in men’s hockey. Should be fun. Then next weekend for snowboarding as part of a client shoot. 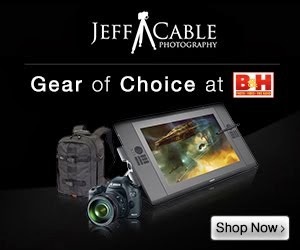 Jeff, thanks again for your compelling photography and story telling. I've been following you since the Sochi games and your tips on this blog have for sure improved my photography skills. I'm always looking for motion blur and repeating patterns. I'm glad this day was a bit less stressful than "Sleevegate" day!